This E-learning Strategy 2016 – 2020 has been developed by the E-learning Unit in collaboration with staff and students at Queen Mary University of London. The central aim of the strategy is to build on our existing strengths to enhance the overall teaching and learning experience at QMUL. The objectives seek to broaden the ways e-learning may be used, ensure that students have an effective and consistent online learning experience and to enable an informed, digitally literate staff with appropriate development opportunities and smart tools. 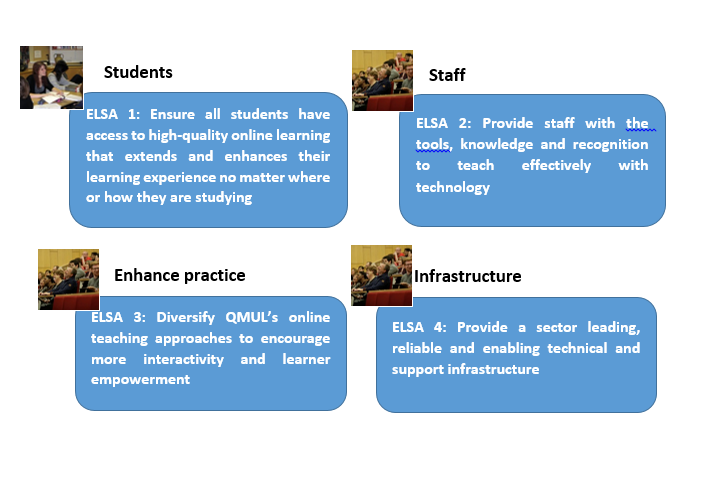 This strategy does not currently address QMUL’s ability to scale-up its wholly online provision. This strategy should be read in the context of the institution’s Strategic Plan and the Student Experience, Teaching, Learning & Assessment (SETLA) Strategy. E-learning can be defined as ‘learning facilitated through technology’. At Queen Mary, that technology might include centrally or locally supported software such as QMplus (the Online learning environment), QMplus Hub (e-portfolios) or Q-Review (lecture capture) or apps on a mobile phone. It might also include other software and tools more widely available or specific to a particular discipline. It can provide fair and equal access to learning to all students. E-learning can provide rich data on activity which can be used to guide students on a personalised journey and keep staff and faculty well-informed. Effective E-learning helps to ensure QMUL delivers World class teaching and learning and meets high student expectations.